Imagine, if you can, the practice fairway at Royal Melbourne. It’s the first round of the Heineken Open, 2007. Thousands of people have gathered to watch the warm ups of greats like Nick Faldo and Ernie Els. And there on the practice tee, right between Els and Jim Furyk, is a bloke in a pair of casual shorts, with a head of flaming red hair and a swing unlike anything seen at a professional event. His face seems familiar but somehow he looks very much out of place in this heady, elite golfing company. “I had said to my caddie, ‘Here, take the bag to the practice area while I run to the players’ room’”, recalls tour pro Paul Gow. “I was waiting and waiting for Gowsy to come back,” confesses the caddie. For Paul Gow, allowing his caddie onto the practice range could have meant a huge fine. But looking back, it was just one of the many funny moments he enjoyed when he broke with tradition and used his close mate, rugby league legend, The Footy Show host and funny man, Paul ‘Fatty’ Vautin as his bagman. They teamed up for about 10 tournaments and both were stung by the criticism it drew at the time. “I certainly didn’t expect the flack,” said Gow. And it wasn’t just Gow who enjoyed Vautin’s company on the tour. During the Australian Open that same year, American golfer, Rich Beem, collapsed with laughter and rolled around the 17th green when Gow’s celebrity caddie had an outbreak of flatulence just before Beem’s putt. “Caddies are supposed to keep up and shut up. Fatty could do neither, but he always had everyone in stitches,” said Gow. 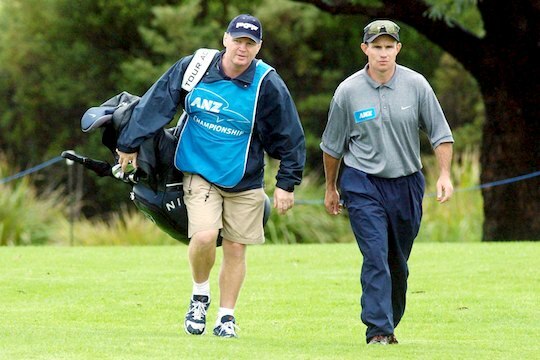 Vautin may have been a ‘crazy’ caddie, but the former rugby league player, State of Origin coach, and host of Channel Nine’s Footy Show, is deadly serious about his golf. “Golf is all consuming to me. I’m in love with the game. It’s different from team sports. It’s a game never won, a constant battle, but it’s also so enjoyable,” he told Golf Grinder. His time spent as Paul Gow’s caddie taught him a lot about this own game but also brought home the quality of the players on tour. “These guys are insane,” said Vautin. Vautin says professional sportsmen, who are used to team sports, would struggle with the stresses of professional golf. Vautin discovered just how stressful professional golf can be when his own game had become refined enough for him to enter the NSW open. His first appearance turned into a nightmare when he froze on the very first tee. Vautin went on to make an eight on the first hole. He pulled it together eventually, but the experience shook him. The trauma of that experience paled into insignificance when, during the filming of The Footy Show in 2005, one of the comedy skits went horribly wrong and Vautin smashed his head into the concrete floor. He was severely concussed and very ill for three months. His doctor told him to try to live life as normally as possible but when he attempted to play golf the severity of the injury hit home. “When I went to take a swing I nearly fell over. I just couldn’t take a backswing at all. It took a long time to come back, nearly a year-and-a-half,” Vautin revealed. Despite what he thinks is an uncertain future, Vautin sounds like a happy man. He’s funny and self-effacing and his enthusiasm for this adopted sport seeps into every story he tells. Are caddies on borrowed time?